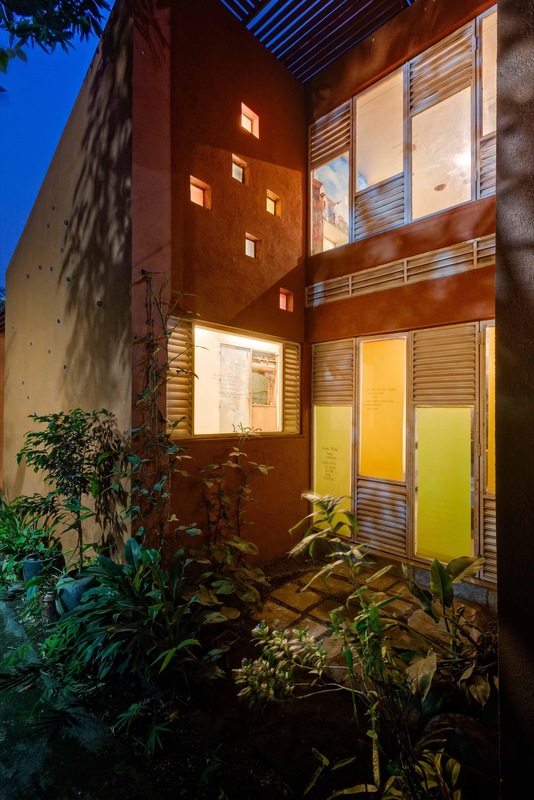 Iskilar, Residence at Pune, by Studio Anhad - ArchitectureLive! 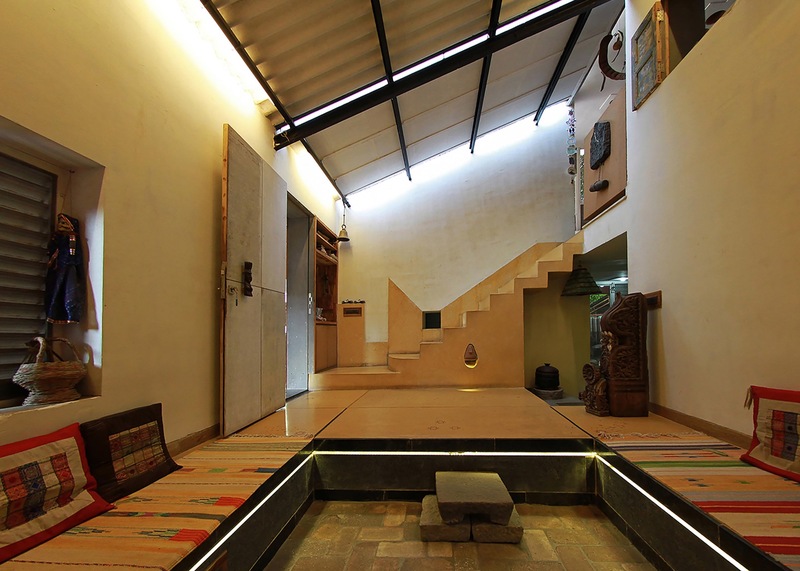 On a tiny piece of land located amidst a conglomeration of dwellings in the small town of Talegaon near Pune City an intriguing geometric volume forms an austere composition enfolding interior spaces which counterbalance the metropolitan rhythm with transcendent privacy and solitude. 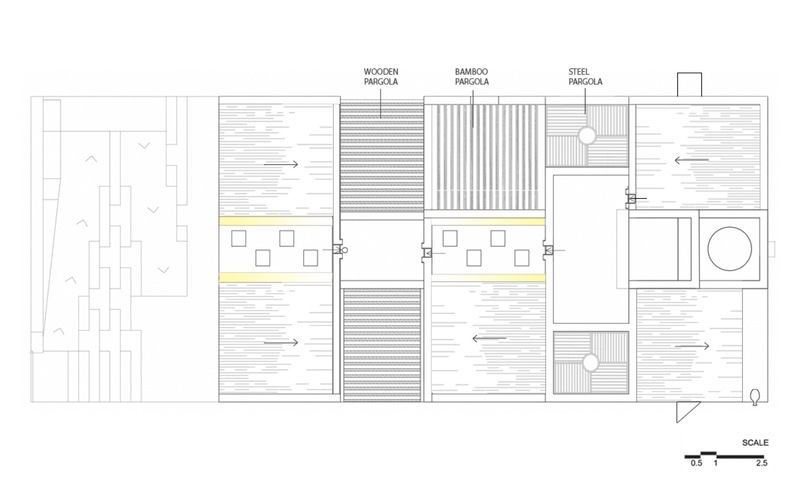 With a perfect assimilation of requirements of the client, who is a terracotta artist, the attempt to create a humane space along with an art gallery within the confines of the site and to fit the requirements of privacy and space utilization evolved a plan endowed with compact volumetric resolution. 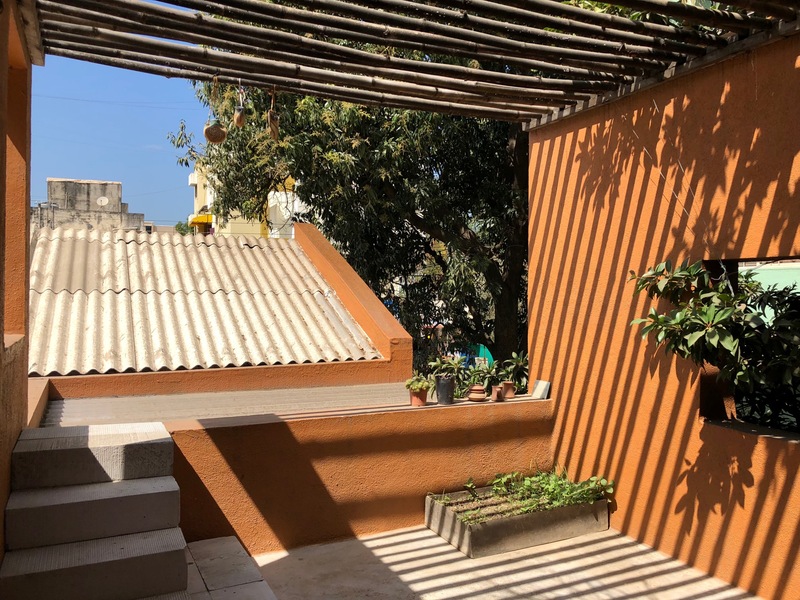 Public, semi-public and private areas can be seen segregated in 3 blocks, flanked by courtyards acting as multi-activity spaces & linked by verandas. The first block houses the art gallery and rainwater harvesting tank below. Steps leading to the gallery are designed in a way that it also works as extended exhibition area. 2nd block includes living and kitchen and terrace. 3rd block comprises of 2 bedrooms on ground floor plus a guest bedroom on first floor. The space connecting the second and third block houses dinning on ground floor and a small work space above. Light plays a significant role here. The courts in between let natural light into the house, otherwise severely constricted by its urban residential surrounding. Windows are avoided on the south side of the building, keeping in mind the site orientation. The living room is cloaked in soft light filtered through the fixed glass windows on the east and west sides and twinkling dots created on the South wall by glass bottles inserted in the walls during the construction. They create interesting patterns on the south walls mimicking the shapes of constellations. Ventilation is achieved through louvers. 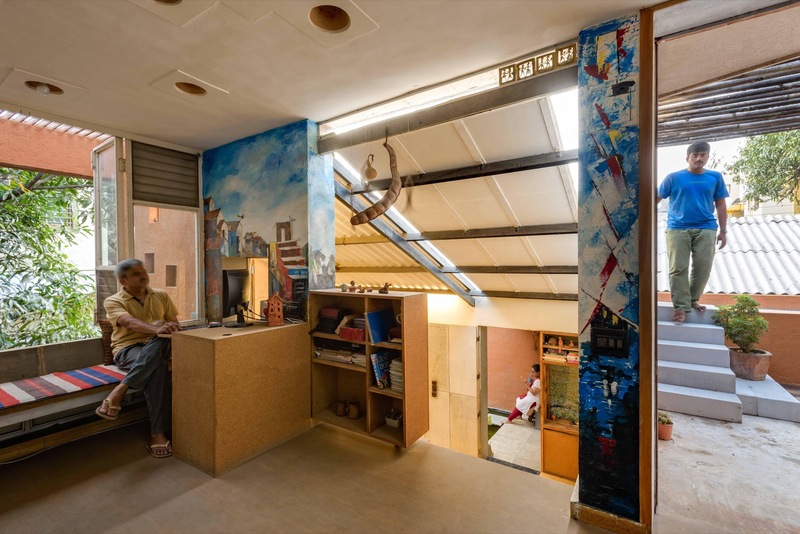 Each area is designed considering intuitive use of space with inbuilt seating and furniture to go beyond the conventional idea of formal living spaces. The lighting and the décor aptly reflects the requisite ambience of the soul of the house. 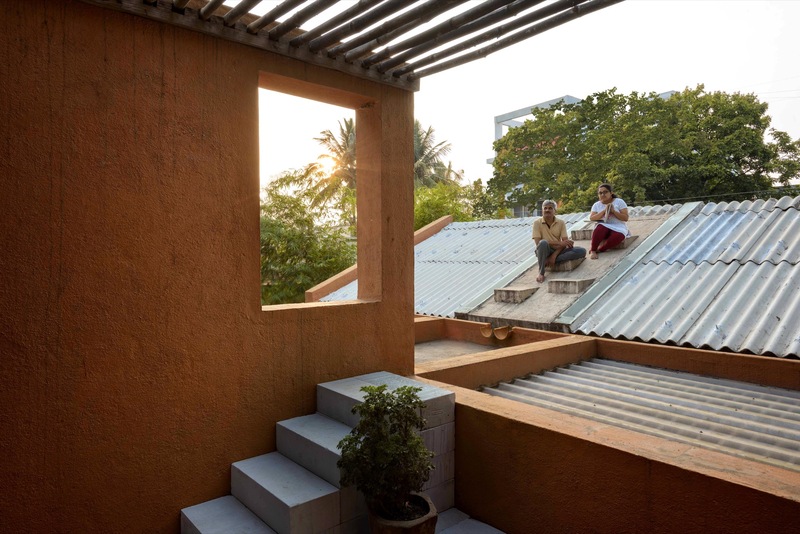 Earthen textures dominate the material pallet, thus attempting to reflect the modest lifestyle of the occupants. It is further emphasized with neutral aesthetics in the choice of furniture and decoration styles. Indian patented stone (IPS) in different colour shades and rendered with patterns of Terracotta beads and small lamps, create a seamless floor in all rooms. Brick walls with basic plaster serve as a canvas for the client’s art work and so are left blank. Forgoing the RCC slabs, Filler slabs cast with Siporex block fillers can be seen opted for. Terracotta pots embedded in slab itself, act as intriguing light fittings. An ever changing pattern of light can be seen throughout the day, formed by wooden and steel pergolas floating above the courts, creating a dynamic ambiance in the courtyard. 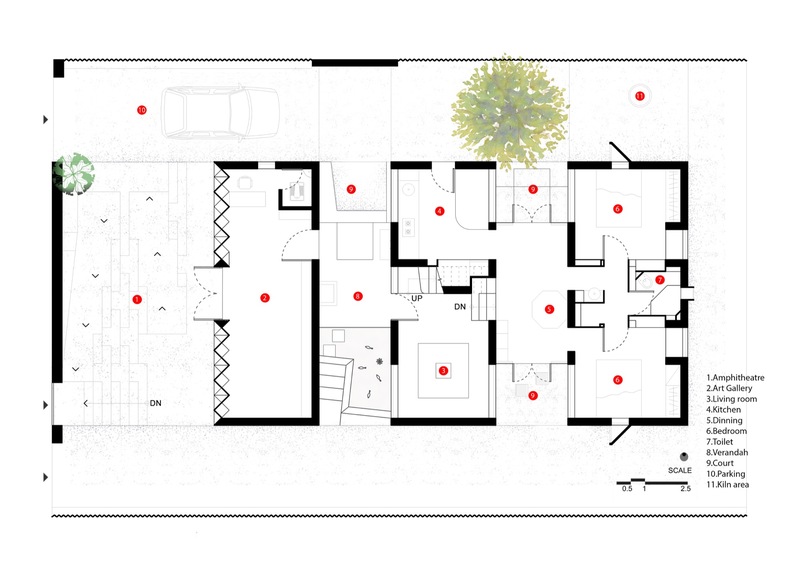 The clients’ amicable and delightful persona is reverberated through each space of the structure. Though part of the overall harmonious combination of diverse spaces, each zone of the building stands out with its own aura, boldly yet simply outlined through this design. The resulting ambience created with these elements ensures a long lasting impression on the beholder. Built up area : 1490 sq. ft. Brilliant design and unique concepts are used in construction of this house. The client and the architect have meticulously created a masterpiece named Iskilar!